My family and I recently went on a weekend trip to Chattanooga, TN. Needless to say I took a ton of pictures. I wasn't sure how I was going to incorporate it into my Daily Life Album for the year....there were just too many pictures. I decided I would have to put together a small album just to document our trip. I needed to do it quickly because I knew that if I didn't it would never get done. You all know what I mean! Here are a few tips on how I put together this album in just 3 nights! 3 nights meaning only a couple hours each night. I think I probably completed this album in less than 5 hours. 1. Pick out a simple template pack to get your started. 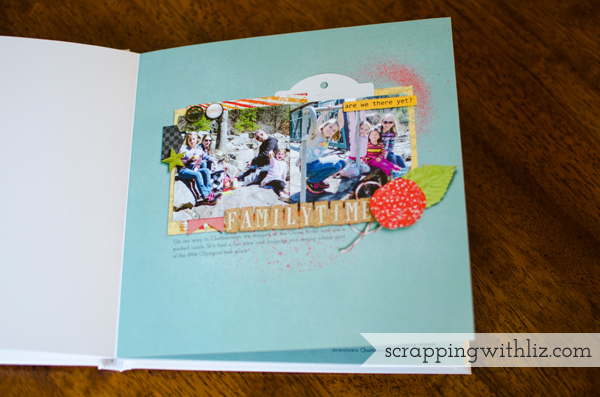 I used my new Simple and Sweet Album Templates III. It was perfect because it has 20 fairly simple, straightforward templates....and they were brand new so I really wanted to use them. 3. Go through your pictures and eliminate, eliminate, eliminate. I had over 800 pictures from our weekend. I narrowed it down to around 80 that I thought were important and really capture our weekend. 4. 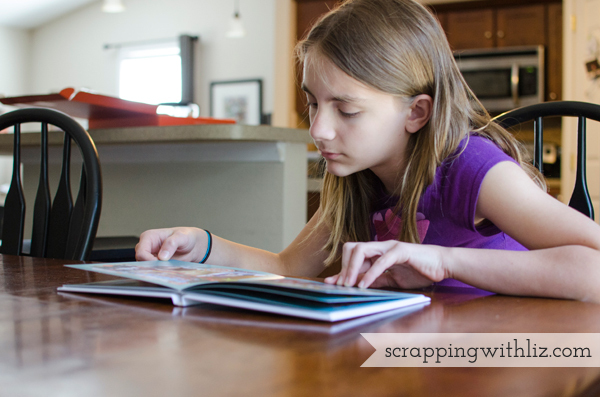 Use the same background paper on each page. It will give it a cohesive look and it will save you a ton of time! 5. Use Ctrl+M to quickly edit your photos once they are on your page. I usually edit all of my RAW pictures in adobe before scrapping them. I knew this would take too much time. I took the jpg image (I usually take both jpg and raw) and just edited them quickly once they were on my page. My kids didn't care if the pictures weren't super awesomely edited. 6. Keep it simple. I kept my journaling, embellishments and; shadowing very simple. Since it was my goal to get a whole book scrapped in a short period of time I needed to not stress about those things. And guess what? My kids still love the book. They don't notice that my shadowing could have been better, or that I could have added a few more pretty embellishments to the page. They honestly just like looking at the photos! I do think that they appreciate that I took some time to put together the album....or at least I hope they will when they get older. 7. Focus...or in other words: turn off your internet! I get easily distracted by the internet: facebook, pinterest, email, etc... 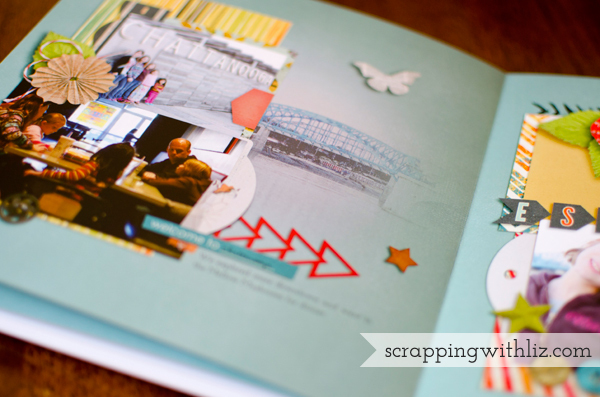 If I sit down and focus on scrapbooking I can get a lot done in a short period of time. 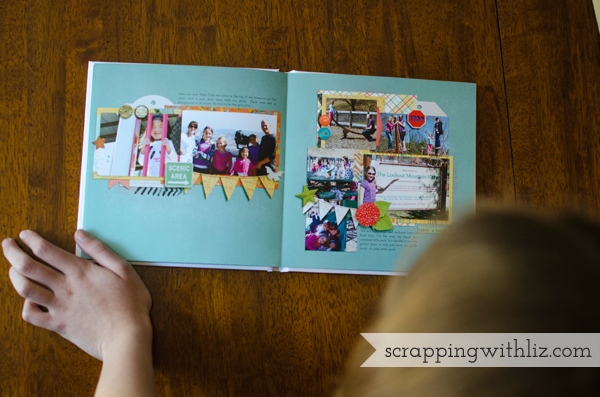 Now that I've told you how I made the album in under 5 hours...I'm going to show it to you, and do a little Shutterfly Layflat book review for you. I've done a few printing reviews here if you want to read about those. 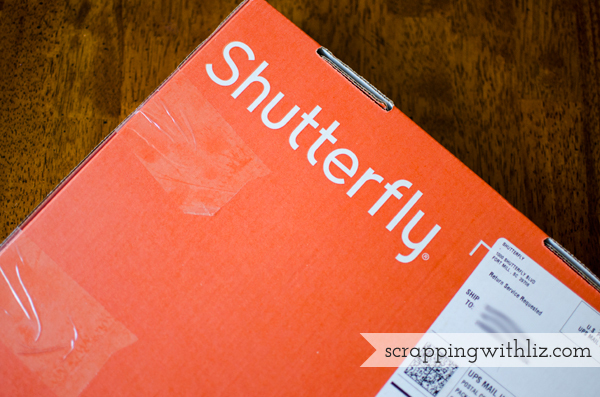 It's super easy to use the Shutterfly website, and all of the books I've got printed have arrived in less than a week of ordering. I get excited when I see this orange package. I printed a 20 page, 8x8, hard cover, layflat book. I had a coupon for a free 20 page, hard cover, 8x8 book. The layflat cost $25. With shipping and tax my total cost was $35.22. 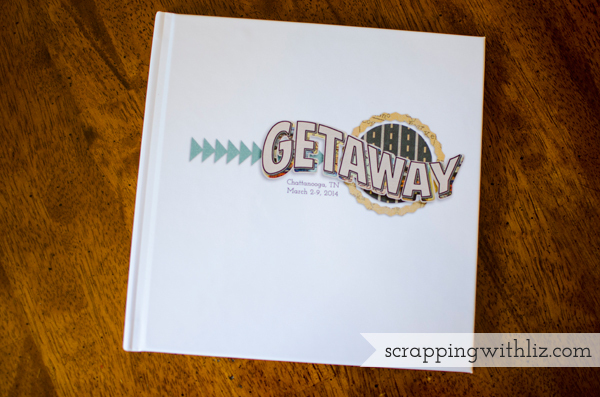 Thanks to Melissa (she left a helpful comment on my last Shutterfly review), I used the Shutterfly template to make sure my cover page would be centered correctly. 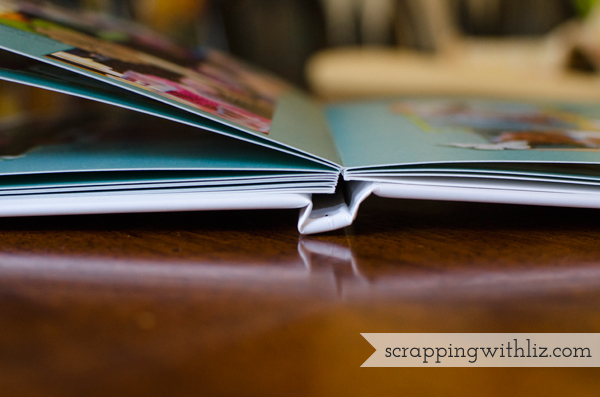 I learned this the hard way after my last Shutterfly book. 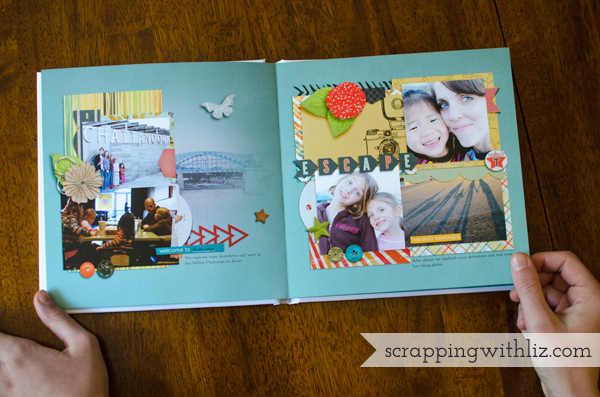 I also used my Title Page Templates and Greetings From Forever Joy Design for my album cover. Easy and simple! I used the spine template from the Shutterfly website to type out my spine text. It looks fabulous on my scrapbook shelf...even though I didn't take a picture. This is how thick it is. There is a blank white page at the very beginning. The pic is a little blurry...totally my fault! Here's what double pages look like. Here's a little close up of the blended photo I did on this page. It looks really nice in real life. And I took a close up of the text. 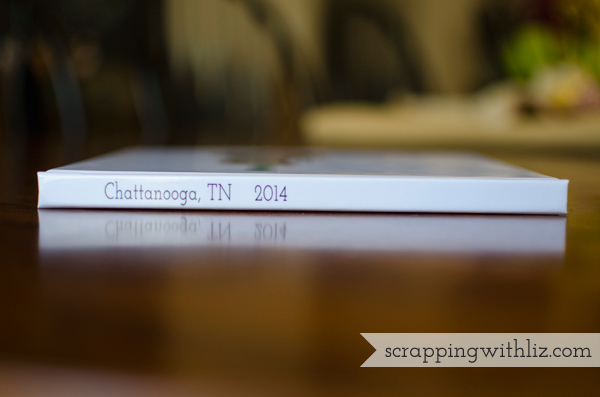 With the 8x8 book I was a little nervous that the text might be a little too small...but it's perfect! 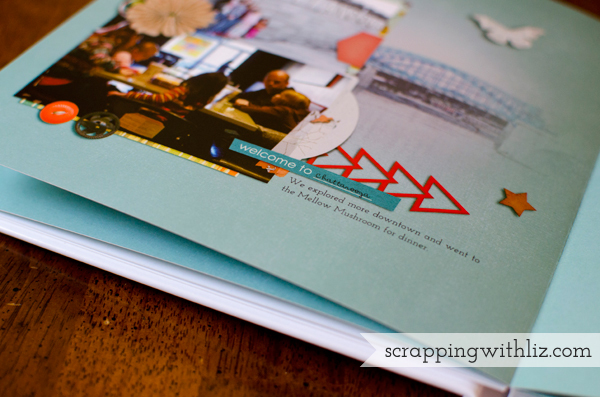 In my Simple and Sweet Album Templates III I do include guides to make sure you watch the edges of your pages. You don't want anything important to get cut off. You can see on this page where part of my leaf got cut off. Apparently I wasn't paying attention to my guides. Thankfully it wasn't anything important like journaling or part of a photo. Here's what the binding looked like. And here's my daughter looking at the album. We've only had it a couple weeks, and it has already been looked at several times. I think it was definitely worth the couple of nights I spent on it. Awesome! I'm impressed! :) Thank you for sharing it! You are so inspiring! I'm going to take your suggestions and try to get my lingering Disney World trip album done. Love your book! It sure looks like everyone had fun. Thanks for the tips on getting books done quickly! 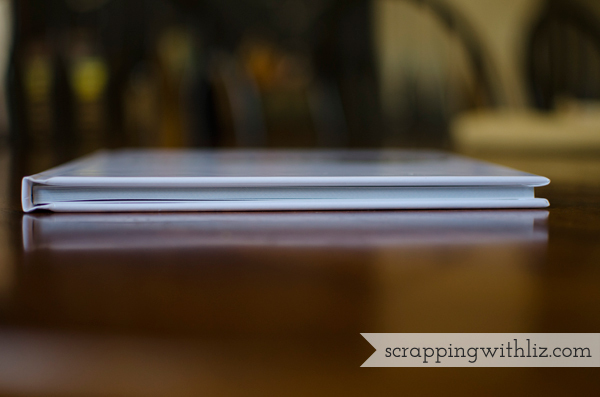 The only problem I have with the Shutterfly Layflat books is if you are doing a big book with a lot of pages it is VERY Bulky and heavy. I had done a 90ish page 12x12 layflat from Shutterfly and I sent it back. It was way to big and bulky and looked odd on my shelf with my other layflats. 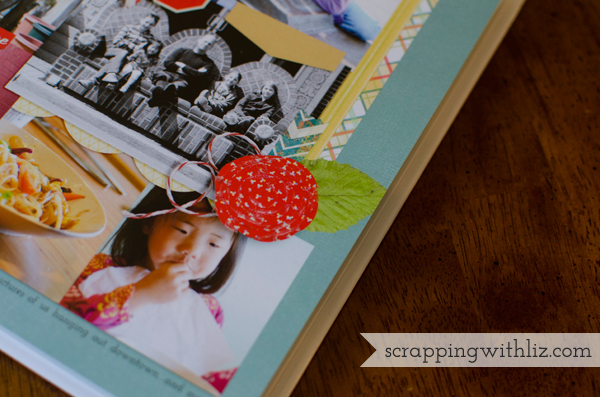 I found Picaboo does the layflats I like BUT You have to be very careful with there cut off margins..
How does your Shutterfly layflat book compare with your Adorama book? I've printed one book with Adorama, and I like the layflat aspect, but I think the colors in my (regular) Shutterfly books look brighter. So... 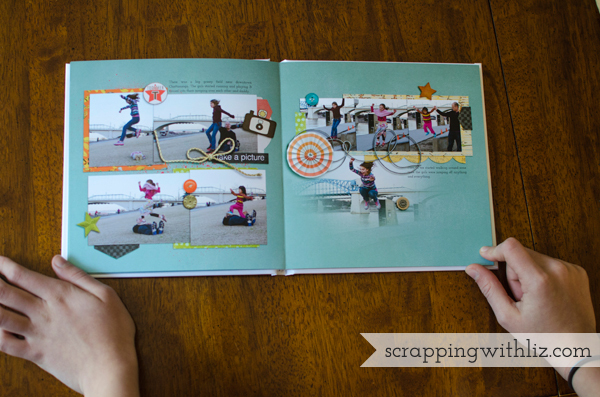 I'm curious if you think the colors in your Shutterfly layflat book are the same as their regular style books. :) Thanks! 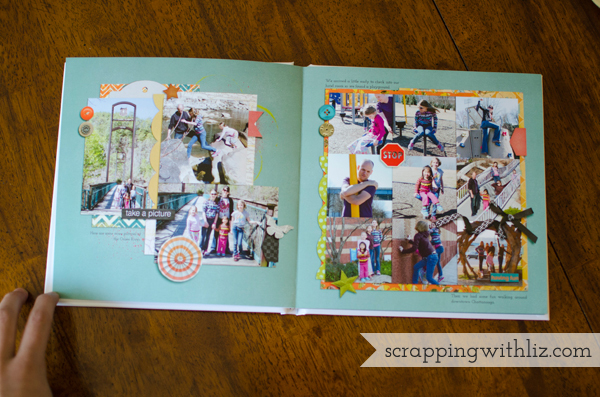 The pages look brighter in the adorama album but I think it's just because of the bright colors in the kit. I don't have any regular Shutterfly books so I can't compare. Maybe that's what I'll have to order next time.